John Gaglione is becoming a well-known name in the strength and conditioning community. 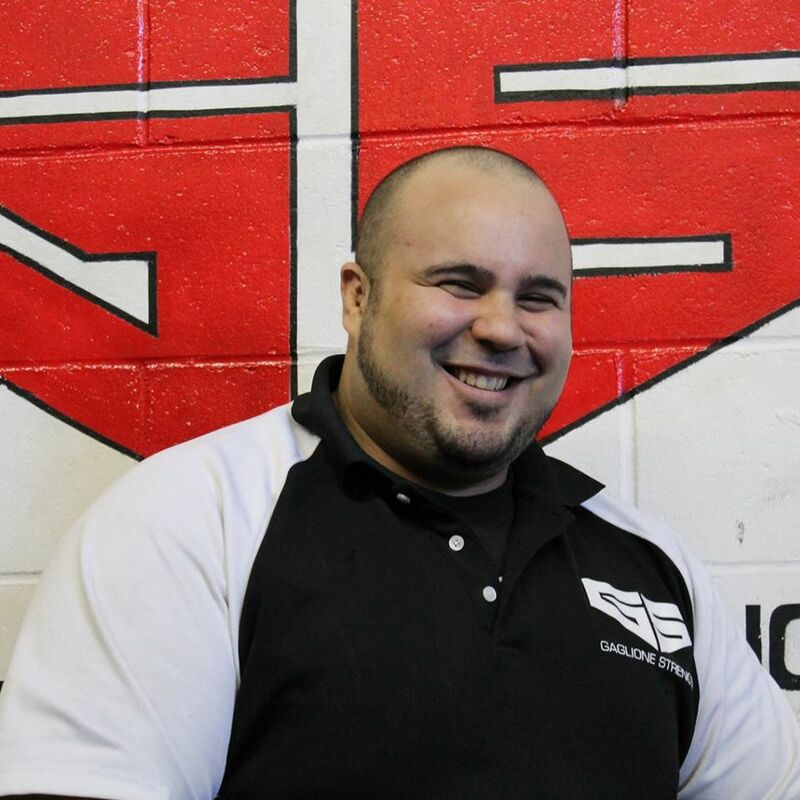 As owner of Gaglione Strength in Farmingdale, New York, Gaglione’s gym is home to a variety of athletes ranging from D-1 wrestlers to world record breaking powerlifters. Gaglione has helped push 30 lifters to achieve national rankings in their weight classes and divisions, all the while heading a powerlifting team of over 40 athletes. In addition to coaching, Gaglione serves as a columnist for EliteFTS.com. Recently Gaglione coached Larry “Wheels” Williams at the SPF Record Breakers, where he broke the WRPA All Time World Total Record in the raw 242 weight class with a 985kg (2,171) lb total. Seeing the impressive resume of accomplishments Gaglione continues to build, I decided to reach out and ask him about his coaching philosophies and methods that lead to success. Before making the switch to coaching full time, Gaglione was a teacher and personal trainer. After six years of teaching full time along with coaching, he realized he was getting burnt out (something Stan taught him) and decided to make the switch to coaching/training full time. A little after leaving teaching, Gaglione opened Gaglione Strength in Farmingdale, New York and has never looked back. What made Gaglione stand out to me was the emphasis on “walking the walk.” Gaglione competes as a powerlifter himself and has recorded some more than impressive numbers in his career. These include a 900 lb squat, 575 lb bench, and a 640 lb deadlift. And while these numbers are amazing, Gaglione hopes to achieve a 1,000 lb squat and 700 lb deadlift in the future – as a coach, he makes it a point to constantly chase goals, even if they’re lofty, something he teaches to his athlete. The ability to practice what he coaches and grind with his athletes is something Gaglione says is fundamental to his coaching success. When you have a coach that practices what they preach, Gaglione believes it creates a different dynamic in the gym. This dynamic branches into one of the major keys Gaglione emphasized when creating a positive gym atmosphere: building a community that is team oriented and supportive. He teaches every athlete that comes into his gym to embrace pillars such as: passion, integrity, honesty, hard work, and many more. These pillars, he feels, carry over to real life and give athletes more in return than the weight they’re moving. Gaglione stresses that training has carry over into someone’s personal life. It teaches lessons, builds community, improves health, and creates a strong mind and body. One of the main questions I had for Gaglione was about the way he programmed for his athletes. Since he coaches world record breaking athletes, I was interested in how he programs with complete confidence and consistency. Gaglione stressed the importance of trying new things and composing dynamic programs with multiple aspects. Along these same lines: creating programs with the most effective minimal dose for longevity in the sport. A prolonged career is something Gaglione values for his athletes, in addition to himself. He mentioned that he makes it a point to try everything at least once, this helps him learn what works best at different times. Everyone is different and has different needs, so incorporating dynamic programs, he can change things accordingly to remain effective. He also stressed the importance of being open and taking note of other’s successes. When I asked about programming methods, Gaglione said he creates programs composed of bits and pieces from his personal anecdotes and other coaches philosophies such as Brandon Lily, Louie Simmons, and many others. By experimenting and being open to other methods, he believes it creates a program that has personal touch, but is backed with previous successes. He learned this from Zach Even-Esh, who stressed the point to him early in his coaching career. What the white belt mentality means: With every situation in life, treat yourself as if you’re a student. You’re always learning, improving, and growing. This mentality he stressed, is so fundamental to the growth of strength coaches, especially at early stages in their career; it allows for constant self-improvement. To wrap up my chat with Gaglione, I asked him: What are two tips you would give to a new strength coach trying to build their voice and coaching philosophy. Without hesitation, he provided me with two great pieces of advice. First, never stop learning. He stressed that those in the industry who think they know everything, generally know nothing. It’s a mentality that can back great coaches into corners that limit personal growth and development. Second, stay humble. He pointed out that working hard, staying true to yourself, and staying honest with your fundamental pillars will naturally set you apart from others. When you create a clear focused vision, others with similar views in the industry will reciprocate and gravitate towards you. This is a major key for one’s continued personal success and growth as a coach.